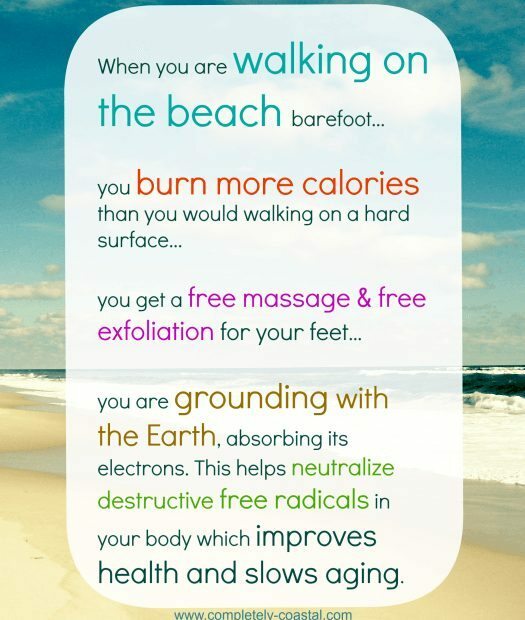 These 3 awesome health benefits for walking barefoot on the beach will make your beach experience even more wonderful. I love Walking Barefoot on the Beach, it’s the best therapy, and the best workout. Feeling the sand between my toes, breathing the ocean air, gazing into the distant horizon, all priceless. The world is far away since all I can hear is the sound of the waves. And it just so happens that walking barefoot on the beach comes with 3 awesome health benefits that you might not even be aware of. As She Walks along the Beach is available as a canvas via my Beach Quotes Shop. When you are walking on the beach barefoot, you burn more calories than you would walking on a hard surface. You get a free massage and free exfoliation for your feet. You are grounding with the earth, absorbing its free electrons. This helps neutralize destructive free radicals in your body which improves health and slows aging. You don’t ever have to talk me into walking on the beach!